I developed my interest in fabrics whilst working in an historic silk mill on turn of the century industrial looms. I was involved with the weaving of gorgeous fabrics such as ottomans and organzas for west end theatrical productions and international films, authentic fabrics for historical houses and the very top interior designers. My credentials are deeply entrenched in the making of fabric from the beginning through to the end product. At that time I rescued my first lurcher Big Cal. He had been in rescue kennels for over two years. 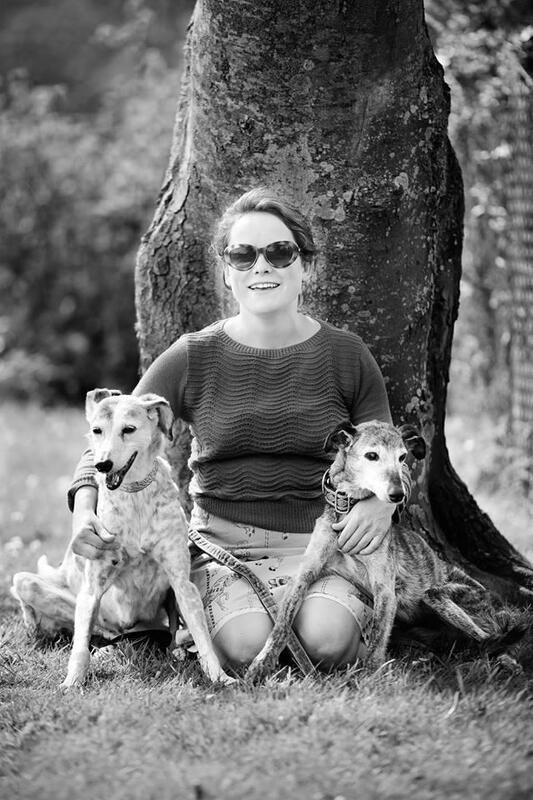 The love affair with sighthounds well and truly began for me and my family. 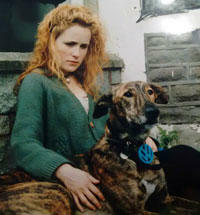 On moving to London and adopting Spanner and then Leno from The Mayhew Animal Home, I started making collars in 2003. Leno slipped her collar one day and after a horrible few hours searching for her, an idea came to me. Leno was safe back at home and I wanted to keep her safe! I started to make martingale collars for my hounds, embellishing them with sari borders from neighbouring Southall. Other dog walkers would say "where did you get that beautiful collar?" I realised then that other hound people also would like to have their canine friends in similar attire. From this very modest start I began to explore the possibilities of starting my own business. Thus so far, I have made many friends in the doggie world which has given me great pleasure. I am pleased to be able to give back (in the way of free collars for auctions, along with heavily discounted collars to sell at shows, kennels and charity websites) a little helping hand to those charities that try so hard to comfort and home those hounds that have been less fortunate in their lives, but will hopefully find that loving home. Please do see my links page where you can source many of these well deserving charities. 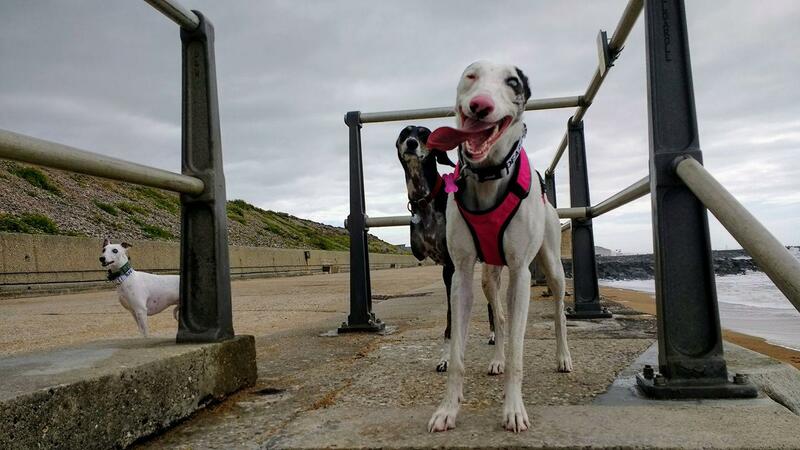 I am now lucky enough to live in beautiful West Bay, Dorset with my young family, partner and currently houndies Limpet the tripod, Mrs Doyle who is deaf and blind in one eye and Scampi who is disabled and blind! I search high and low for beautiful trims for my collars. The trims are all woven on Jacquard looms and are sourced from India, America and beyond. 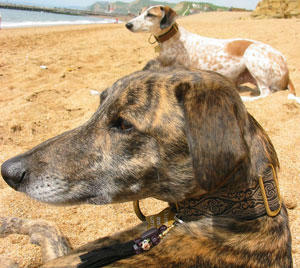 The coats are designed for sighthounds and fitted to your dog's measurements. My standards are high as should yours be! I am proud of my delivery times. Orders are usually sent well within one week, usually the same day! I believe you will find these collars and coats second to none. Thank you for taking the trouble to read my "Welcome Page" and please do not hesitate to contact me if you would like further information about my products.